Free vector icons - Looking for an easy way to explain your App's usage via touch screens gestures? How do you get users to nudge, pinch, drag or rotate? You could try writing it out, but it is hard, isn't it? With this set of Touch Screen Gesture Icons, it pretty much makes it self-explanatory. No text required. 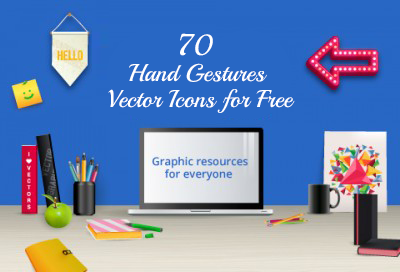 Today, we bring you 70 free vector icons for Touch Screen gestures to make your users better understand instructions. Make your application user-friendly with these touch screen gesture icons. Include them in a Demo. Include them in a User Manual. Include them in your banners. Just about anywhere you think users will need it. You can easily add multi-touch features to your application and explain it to your users with the help of these icons. Sub-license, resell or rent it. Ready to grab these touch screen gestures icons for free?